The City of Ormond Beach Department of Leisure Services﻿ proudly presents the 20th Annual Home for the Holidays Parade Saturday, December 11th, 2010 at 6:30PM. 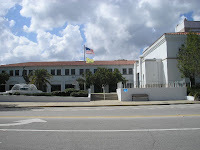 The parade route runs along Granada Blvd east to City Hall. expected to line the approximately 1.5 mile parade route that begins at Yonge Street and Division Avenue. The Home for the Holidays Parade then turns north to Granada Boulevard and then turns east to South Beach Street and passes City Hall and the Review stand. Storefront business location for lease in Ormond By The Sea Florida.